If you spend a great deal of time running around your office or warehouse and it is hot inside, you need to be sure that dirt and sweat do not collect in two spots that people can see more easily. The collar of a shirt and the underarm part of a shirt are two spots that collect sweat and eventually turn yellow or black. Armpit stains and dirt around the collar can damper the effect that your great personality has on people and that at times can be bad. Needless to say, there are great ways to cure both of these problems without alerting anybody that they were present in the first place. SolutionsThatStick.com has all of the great items you’ll need to make this happen. A person suffering from ring around the collar will often be doing so because he or she did not take the proper precautions when wearing the shirt, cleaning the shirt, and trying to remove even the smallest stain that was present. 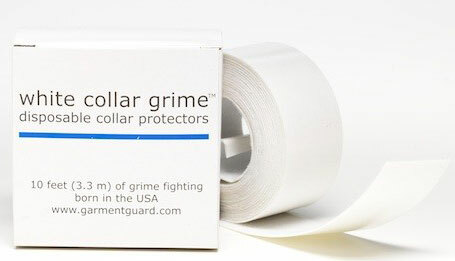 This normally requires a huge deal of scrubbing or bleaching, but if you invest in White Collar Grime: adhesive collar protectors, you’ll have zero problem. It’s as simple as taking a strip the appropriate size off of the roll and attaching it to the trouble area. When you need to remove it due to it becoming dirty you can do so without the grime ever touching your shirt. This roll lasts quite a while and can easily be replaced for a small amount of money. If you are curious as to how to prevent sweat stains that you hate, you can also use this around areas that you sweat such as on a hat or any other clothing item that is white. However, if you suffer from sweating under your arms and need something to cover that up, the strips won’t work as well. What you can use instead is the great Garment Guard. These items can be attached to the undershirt or jacket that you are wearing to completely eliminate troubling stains and even smells from bacteria that was not removed. This product comes in a pack of five and should never be reused, but will definitely work if you are having a night out on the town or doing a hard day of work outside. This entry was posted in Cloth care tips and tagged cloth care tips on March 13, 2013 by Yami.